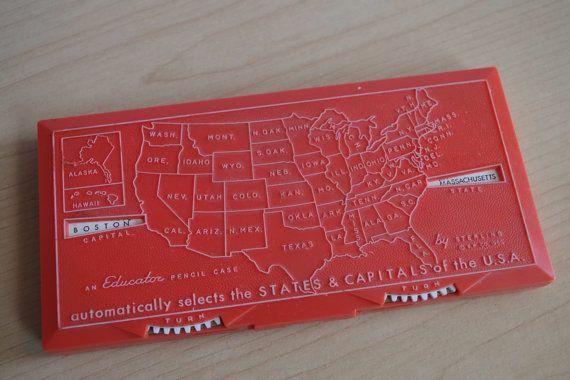 I learned the state capitals from a pencil case. It was deep cherry red, with the map of the United States outlined in raised white lines, two windows on the sides, and wheels to adjust the text appearing within. Change the capital, and the state would flip, and vice versa. I remember reading the combinations: Albany, New York; Dover, Delaware. Harrisburg, Pennsylvania; Nashville, Tennessee; Pierre, South Dakota.